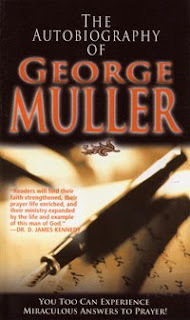 Today I finished reading The Autobiography of George Müller. I was very impressed and challenged by the faith and prayer life of this godly man. These excerpts from his diary allow Müller to tell his own story of his journey from a life of sin and rebellion to his glorious conversion. Read of his struggles and triumphs as he establishes orphan homes to care for thousands of English children, depending on God's response to his prayer of faith to supply all things. George Müller's unwavering, childlike dependence upon his heavenly Father will inspire you to confidently trust the God of the impossible in every area of your life. That is so neat to see a man so devoted to trusting God for everything!